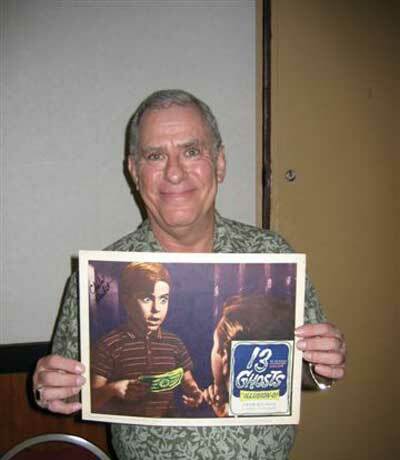 The 2008 Monster Bash featured Guests of Honor Don Sullivan, Pat Priest, Lisa Loring, Donna Douglas, Donnie Dunagan, Robert Dix (sponsored by Larry Fultz Jr.), Elizabeth Shepherd, Felix Silla, Jonathan Haze, Jackie Joseph, Forry Ackerman via Wi-Fi Sci-Fi, Charles Herbert, Bert I. Gordon, Susan Gordon, Richard Gordon, Chilly Bill Cardille, and many others. 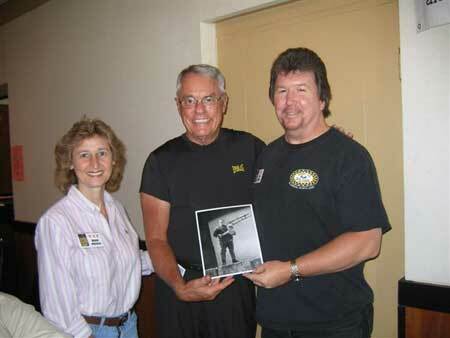 Photos provided by Barb Heiss, Kevin Slick, Pat Gonzalez, Ted Bohus, Steven & Maxine Wrzesien others - thank you! The movie and event room was a non-stop affair all weekend! Director Bert I. Gordon and fan Maxine. 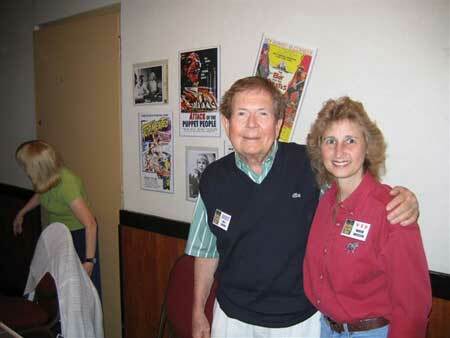 Vincent Price co-star Charles Herbert from THE FLY! 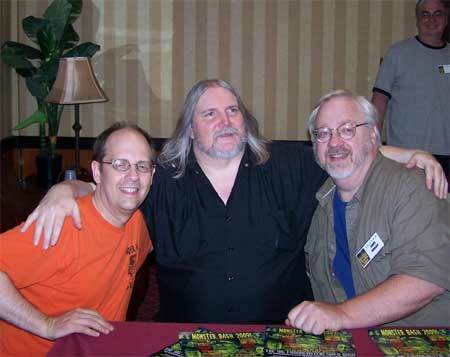 Convention family - Ron Adams (Monster Bash), Kevin Clement (Chiller Theatre), Dave Hagan (MonsterMania) at Bash! Pat Gonzalez caught this photo outside the hotel at night. 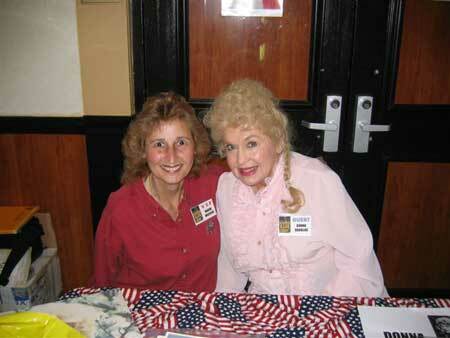 Donna Douglas ffrom EYE OF THE BEHOLDER on THE TWILIGHT ZONE and Elly Mae from THE BEVERLY HILLBILLIES delighted fans and talked to everybody! Donna signing a bottle of Hillbilly Barb-B-Que sauce! Ron Chamberlin (Monster Bash Make-Up Master) as Grampa Munster in the Drag-u-la, with Paisley Adams as Wednesday Addams, and Ron Adams as a crazy conference programmer outside the front of the Days Inn! Vincent Price co-star Elizabeth Shepherd (TOMB OF LIGEIA) and Bash staffers cut the giant sheet cakes for fans at the Saturday Night Reception. 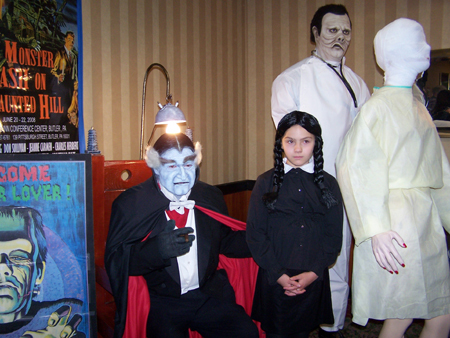 Grampa (Ron Chamberlain), Wednesday Addams (Paisley Adams), and Jerry & Susan Armellinos full-size figures in the background. Bash attendee Maxine and actress Donna Douglas smile for the camera! 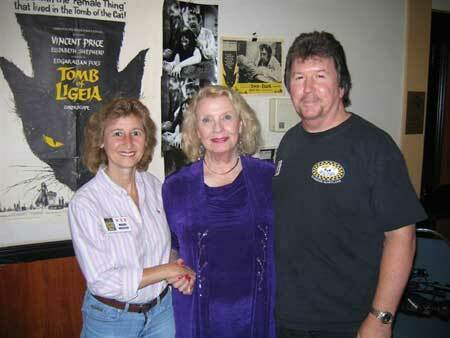 Maxine, Donnie Dunagan (TOWER OF LONDON - SON OF FRANKENSTEIN), with Steven at Monster Bash! 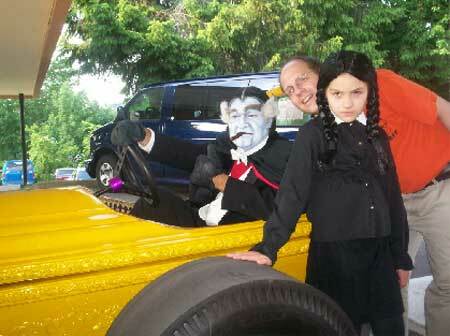 The Wrzesienand's pose with actress Elizabeth Shepherd (center) at Monster Bash. 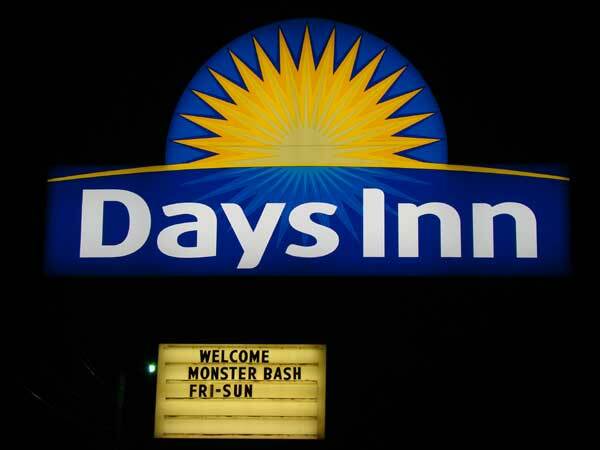 Free givawaysare thrwn out to attendees oin Saturday night...monster goodies. 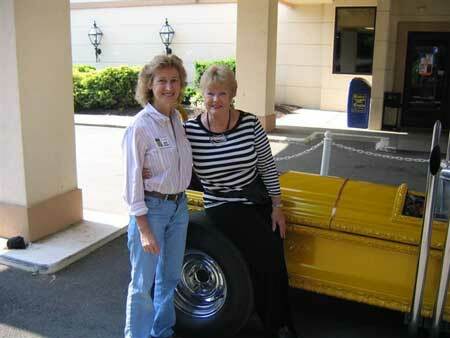 Maxine Wrzesienand with Pat Priest (Marilyn Munster) at the Drag-U-La in the parking lot! 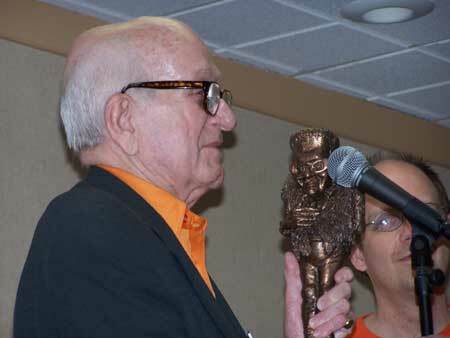 Richard Gordon receives a lifetime achievent award (MBA - Monster Bash Award - "The Forry) on Saturday night. 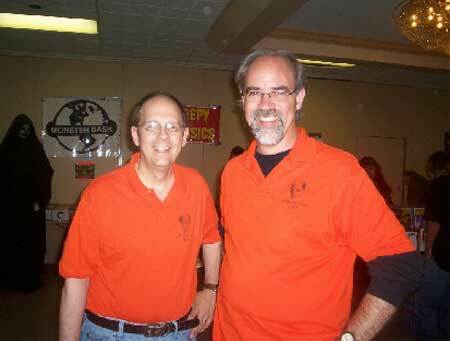 37 years of friendship - Ron Adams and teacher-musician Kevin Slick at Monster Bash. Bash attendee Steven gets the juice turned on in the lobby at Grampa's chair (thanks to Stephen Marcum for the great prop). 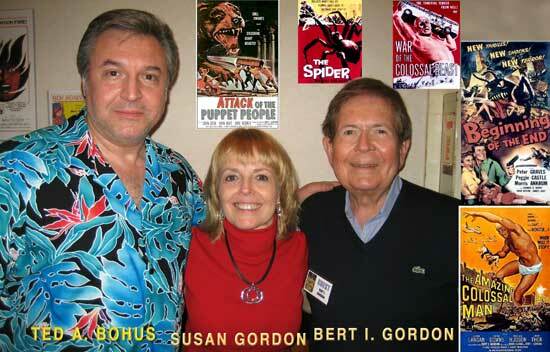 Movie producer/director Ted Bohus with The Gordons - actress Susan and director/writer Bert. 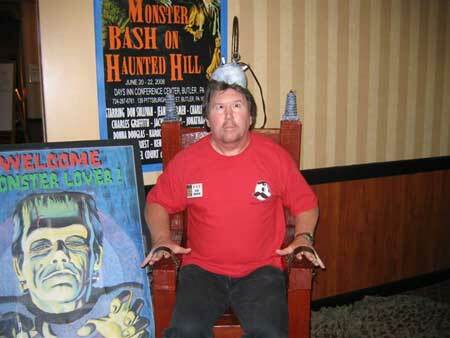 More Photos from Monster Bash 2008 - CLICK HERE!